KRANTI India's most leading and quality oriented company engaged in manufacturing and exporting of Mechanical Water Meters and Electromagnetic Flow Meters. The company was incorporated in the year 1980 in the field of Water Meter Manufacturer under the brand name of 'KRANTI' and has acquired an established reputation and goodwill in every corner of market for its sturdy construction, international quality and all around performance. 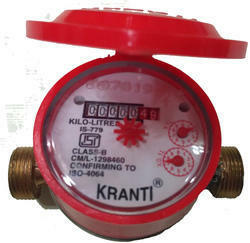 Looking for Kranti Domestic Screwed Water Meters ?